Sometimes Americans think we have won a war, only to realize years or decades later that our victory was incomplete. Now we are facing an eruption of anger over a war we waged more than a century ago. Rarely has blowback from an overseas intervention come back to haunt us so long after the shooting stopped. Duterte’s grievance is rooted in history. Americans, he asserted, unjustly seized the Philippines in 1899, waged a horrific military campaign to suppress native resistance, and “have not even apologized to the Filipino nation.” He waved photographs showing bodies of Filipinos killed in that war. Most Americans would have no idea what these new Filipino leaders are talking about. We forgot the Philippine War long ago. Filipinos remember it vividly. It stands with the horrors of Japanese occupation during World War II as one of their great national traumas. A very old debt is finally coming due. For many Filipinos, his passionate outbursts are signs of his fearlessness and willingness to act. Relations between our countries began with shattering violence. Americans helped crush Spanish power over the Philippines in 1898, but rather than allow independence, the United States took the islands as a colony. President William McKinley directed Filipinos to accept “benevolent assimilation” and submit to “the strong arm of authority.” Senator George Frisbie Hoar of Massachusetts called this “a message of tyranny, of hate, of oppression, and of slaughter.” Many Filipinos agreed. They rebelled against American power. The resulting war left hundreds of thousands of dead. Americans ruled the Philippines until finally, after retaking the island from Japanese occupiers, allowing independence in 1946. For most of the 70 years since then, we have guided Filipino security policy. That may now be changing. Today, American military commanders are pressing two strategic projects in the Philippines. First, they want the Philippines to be a bulwark in our campaign to confront China and resist its claims in the South China Sea. Just as we push our European allies to take a hard line against Russia rather than seeking compromise, we want Asian countries to defy China, not accommodate its interests. In April, Secretary of Defense Ashton Carter announced in Manila that the American and Filipino navies had begun joint patrols in the South China Sea. “There will be a regular, periodic presence here of American forces,” he added. That now seems uncertain. The Pentagon also considers the Philippines an active front in its war on terror. A Muslim-led insurgency is raging on the island of Mindanao. Hundreds of US Special Forces troops are reportedly deployed there. Their precise mission is unclear, but it is based on the premise, widely shared in Washington, that the best way to weaken insurgents is with firepower. President Duterte believes the opposite. Rather than reinforce American counterinsurgency forces, he wants them out. American troops, he said, intensify wars rather than calming them. “For as long as we stay with America, we will never have peace,” he reasoned. “Special Forces, they have to go.” Then he ungenerously referred to the results of American intervention in Vietnam, Iraq, and Syria. 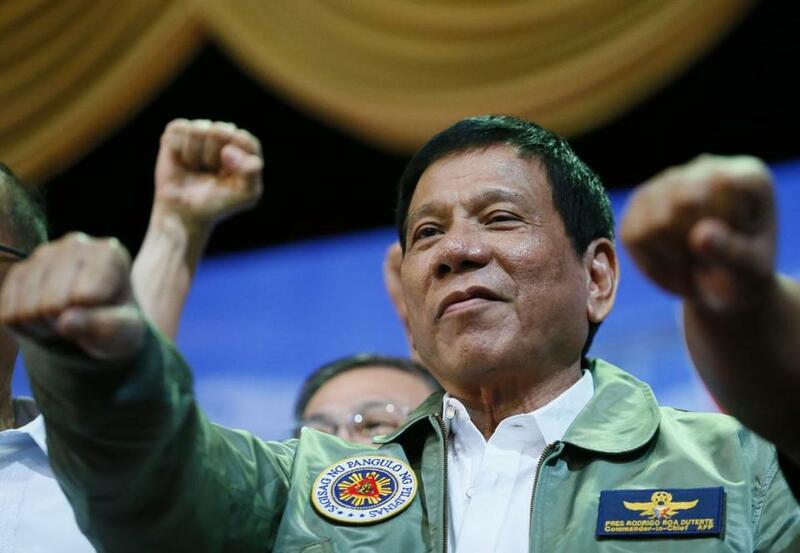 Since taking office in June, Duterte has been unfailingly provocative. He has publicly cursed the pope, the president of the United States, and the secretary general of the United Nations. His encouragement of vigilante violence, which has led to several thousand murders, suggests that he is being fully honest when he says, “I don’t care about human rights.” His foreign policy turnaround is another sharp break with Filipino tradition. All of this has made him immensely popular. According to one recent opinion poll, 76 percent of Filipinos support him. “This is the massacre at Jolo — look at the bodies there,” Duterte said as he displayed gruesome photos taken after an American attack in 1906. Americans might find it puzzling that a Filipino president would use the story of this long-ago massacre to justify ending his country’s security partnership with the United States. Invasions and occupations, it turns out, leave deep scars. They provoke anger that becomes part of collective memory. It is passed down through generations. That is why a 110-year-old atrocity has suddenly leaped from the pages of history to reshape today’s world.